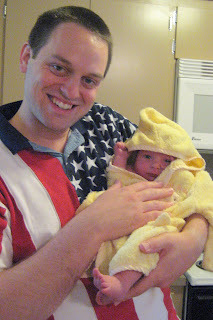 We started off the day with a bath (amazing how quickly those triple chins can start to smell like spoiled milk.) Daddy gives much better baths than Mommy. 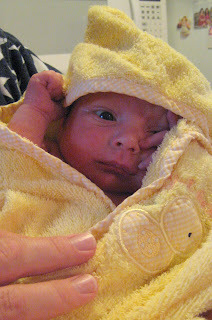 I have resigned myself to sponge baths for fear of Matty slipping out of my hands in the bath tub. He didn't seem to mind the wash down at all. He is such a content little boy! The day was not as sunny as we would have liked, but nonetheless we headed over to Grandpa and Grandma's beach for BBQ and family fun. Neither Matt nor I were feeling the best (that yeast infection has spread to his mouth so feeding time is painful for him and I am still trying to recover from Matt's birthday) so we spent most of the afternoon inside. Joshua got to sit out on the lawn and enjoy the fireworks across the bay with a glass of Sangria in hand. 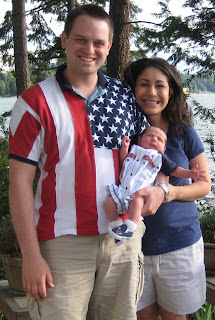 Don't we all look patriotic?